Featuring a great offbeat wedding save the date announcement card complete with polka dots, stars, swallows, hearts, roses, anchor and of course some cool tattoo typography! 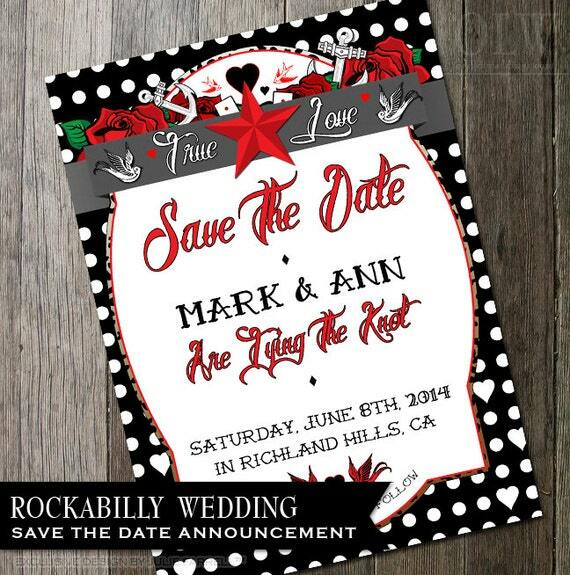 This fun yet elegant and hip wedding invitation will make your rockabilly themed wedding a success! This listing is for a digital file to print on your own. All text will be customized with your specific wording once the purchase has been made. ♥ WHAT DO I GET FOR THE LISTING FEE? • This can vary depending on the dropdown choice you select (if available). • You will receive a digital file(s) which you can have printed on your own (either on your home printer or by a printing company of your choice). • Simply add your selection to the cart and place your order. • Send us an email (doubleactiondesign@gmail.com) with your wording, order number, text of choice and any color changes. Please be aware that every monitor and printer is calibrated differently, resulting in slight variations from what appears on the screen. Paper color and stock may also affect the final printed color. For best results, we recommend printing on 100lb or better WHITE card stock, as all of our files are full color. Odd Lot Weddings IS NOT RESPONSIBLE FOR PRINTER ERRORS OR COLOR SHIFTS. ♥ NEED A COORDINATING INVITATION, THANK YOU CARD, INSERT, PARTY SUPPLIES OR SOMETHING ELSE? Please convo me if you are in need of cupcake wrappers, cupcake toppers, water bottle labels, thank you's or other various printables to match this listing. Just ask, and we can create whatever you need! If you would prefer to have this design created for a different occasion, that is not a problem! All of our designs can be customized to suit baby showers, bachelorette parties, bridal showers, birthday parties, graduations, etc... Just ask! Odd Lot Weddings is happy to offer full-color printing! All invitations come with white envelopes, and all postcards are two-sided, full-color cards. Our printing services include a 48-hour turnaround for receiving a proof and 7-10 days shipping after proof is approved. Expedited shipping is available for an additional fee. To obtain a printing quote for your design, please contact me by clicking on the ASK A QUESTION button above (next to price) or by email at doubleactiondesign [!at] gmail.com. As mentioned above, you can also print the invitations yourself on your home printer or have them printed by a printing company of your choice. • Add the item to your cart, and pay for your purchase. Etsy will email you an order confirmation. • Submit all of your custom text information as seen on the product design (name, dates, location, etc.) through the "Note to Seller" section at checkout. Use our picture as a guide for what information we need. • Every effort will be made to send you a low resolution watermarked proof within 3 business days via the email associated with your Etsy account unless you indicate otherwise. Please note that this timeframe is subject to change. • When you receive the proof, thoroughly review it for any errors and/or misspelled words. Please also verify that all dates and times are correct. • Once everything is verified, please reply back, indicating that you approve the proof. Please double check that all wording is correct! • We design in CMYK at 300 dpi and provide 1/4" bleeds on all files. You are responsible for making sure your printer can print to the above file specifications or for advising us of changes in file requirements when you purchase the listing. Any size changes made after the design work has begun will result in additional fees. • A proof will be sent to you within 48-72 (business) hours after receiving your payment and required information. The file(s) can only be used for your personal use and cannot be used for any other purposes. • Odd Lot is open Monday through Friday from 9:00am to 3:00pm CST. • We are closed on Saturdays, Sundays and all holidays. • Every effort will be made to respond to inquiries within two business days. All designs are © copyright protected by Odd Lot Paperie™ and are available for your personal use only after you purchase them. The selling and reproduction of designs by Odd Lot Weddings is strictly prohibited. Please do not copy, steal, redistribute or duplicate our designs. By purchasing a listing from us you agree to our store policies and to abide by them.